When the wife and I posted our "So you are looking to buy an UK property" piece on June 7, we created some confusion over the issue of sub-sale, i.e. selling the property to another party before completion. 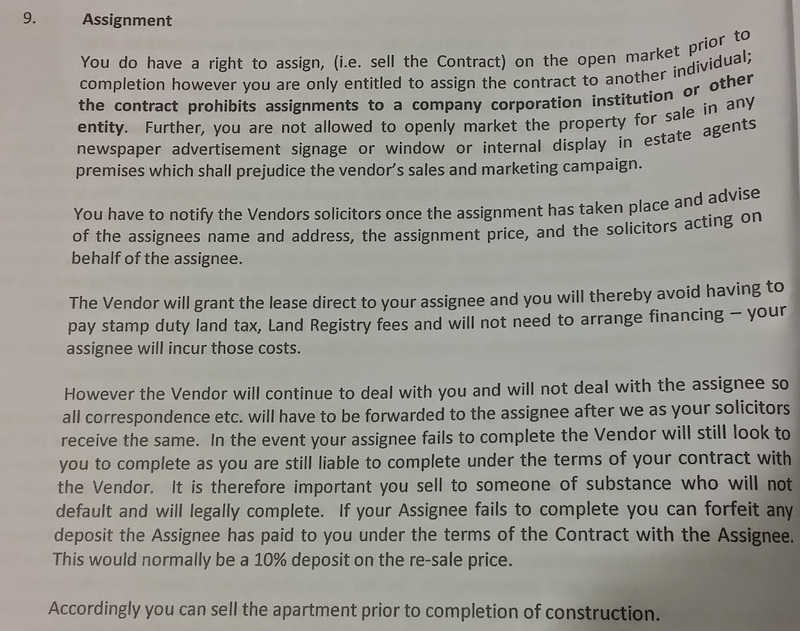 We had said that sub-sale is prohibited but it turned out that one of our readers had actually bought a London property thru a sub-sale. We finally managed to retrieve the legal documents we had received from our UK solicitors for the Camden property that we used to own. On closer inspection, we realized that we were wrong (yes, we do admit our mistakes) BUT maybe not entirely so. In the Singapore context when a sub-sale is concluded, all rights and obligations of the property is transferred to the new buyer. So in the event that the new buyer defaults, the liability falls solely on the new buyer.﻿ In another words, whatever happens after the sub-sale of your property is concluded has nothing to do with you. But in the case of a London property, you can only assign the contract to a new buyer when you "sub-sale" your property. You remain liable even if the sub-sale process is concluded, i.e. should the new buyer defaults, the developer has legal rights to go after you to complete the purchase of the said property. In addition, the developer will continue to deal only with you (and not the new owner). So you effectively become the go-between of the developer and the new owner until legal completion. In summary, one can actually do a sub-sale on a London property. But the developer will still go after the ORIGINAL buyer should the deal goes belly-up subsequently. No Comment to " London property: So is sub-sale allowed? "